While in the US, we flew back to Kansas City for a few days visiting family, then drove to Omaha for two nights to visit Andy and Sugi, whose wedding we had just attended in Maui. To make the trip even more fun, we brought my six- and nine-year old nieces along. 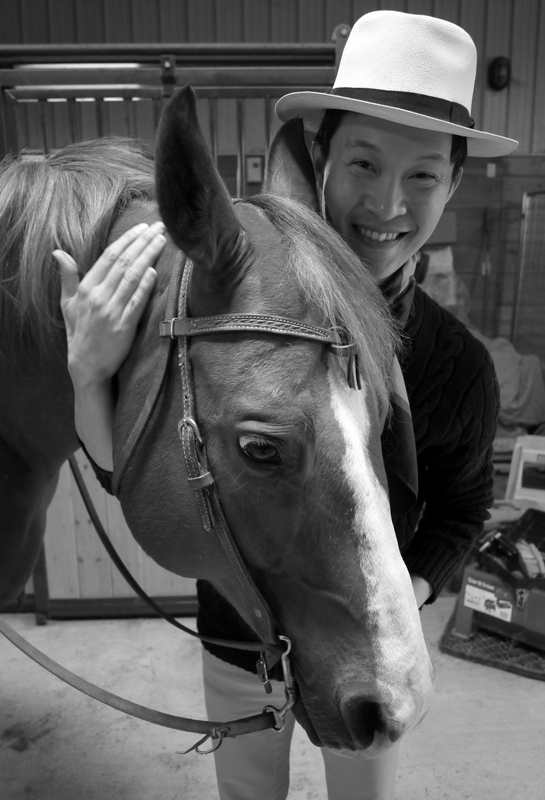 The main event: ride one of Sugi’s mother’s horses. 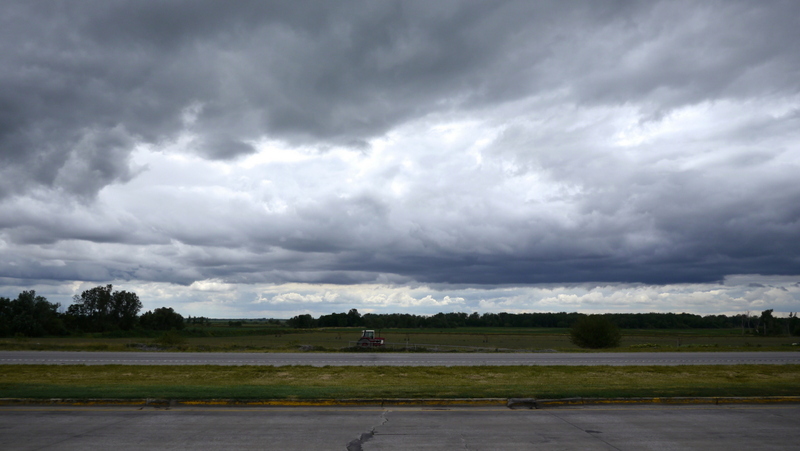 On the three-hour drive north to Omaha, we skirted around a rather imposing storm front, managing to stay dry most of the way. The first evening at Andy and Sugi’s house was a bit of a challenge as the girls were supposed to share a bed but the younger one takes a long time to fall asleep. Her older sister couldn’t take it, so decamped to our bedroom, where we set up a comforter, blanket, and pillow on the floor. We had the girls wear a helmet for safety’s sake. Their reactions to the horses were interesting to watch. If you aren’t familiar with horses, I can understand how you would be a little in awe of them. They’re awful large, especially when you are a child. We pose with our ride and Sugi’s mother, Myra. Many thanks to her and her husband Mike for their hospitality. 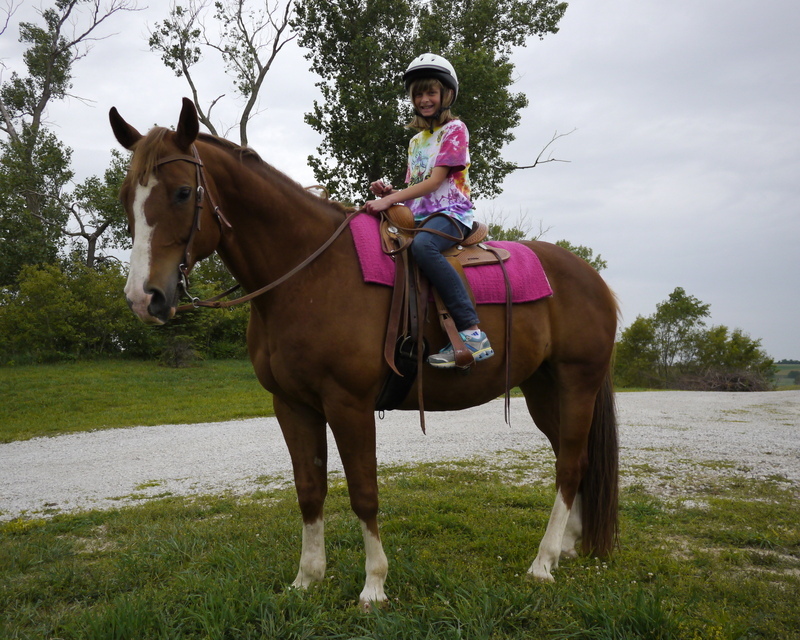 The girls had a great time and helped brush the horse after the ride. Andy and Ava seemed to be the perfect foil for each other. We stayed for dinner at Myra and Mike’s house, which was a mixture of foods (including grilled items!) that included several things that spoke to Myra’s heritage growing up in a Japanese-American household on Hawaii. There were a few dishes that the girls were unfamiliar with, but for the most part they gamely gave everything a try. 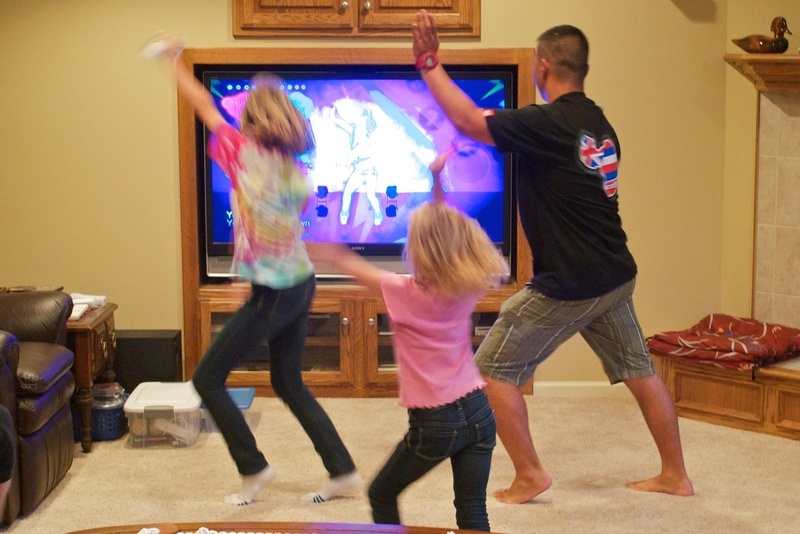 After dinner, it was some time for Dance Nation! 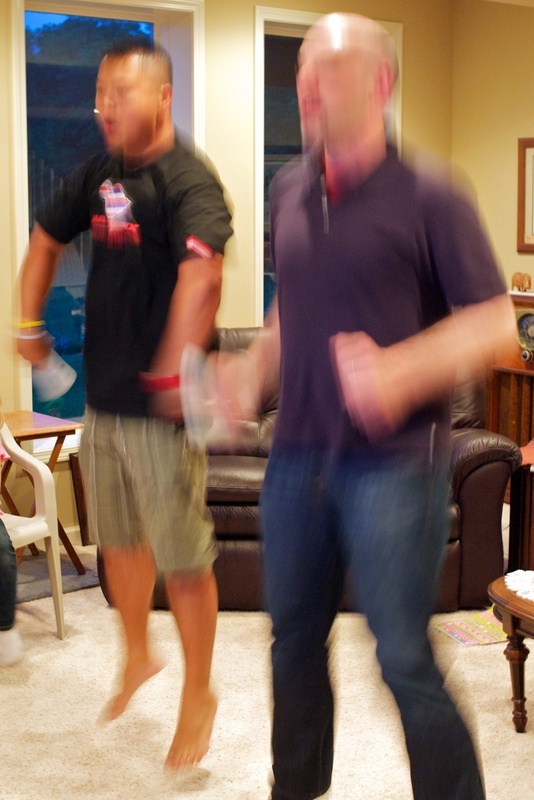 You can probably guess which song Andy and I were dancing to. 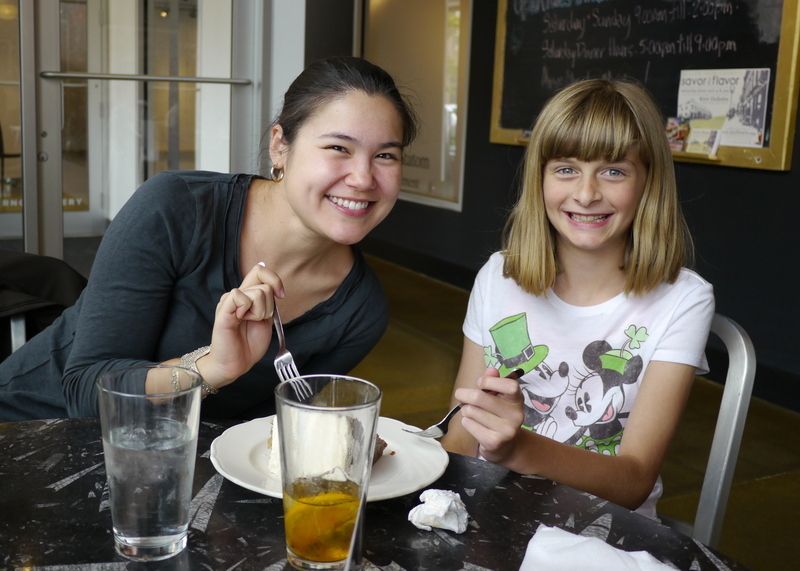 Sugi and Emily share some dessert at brunch the following morning. 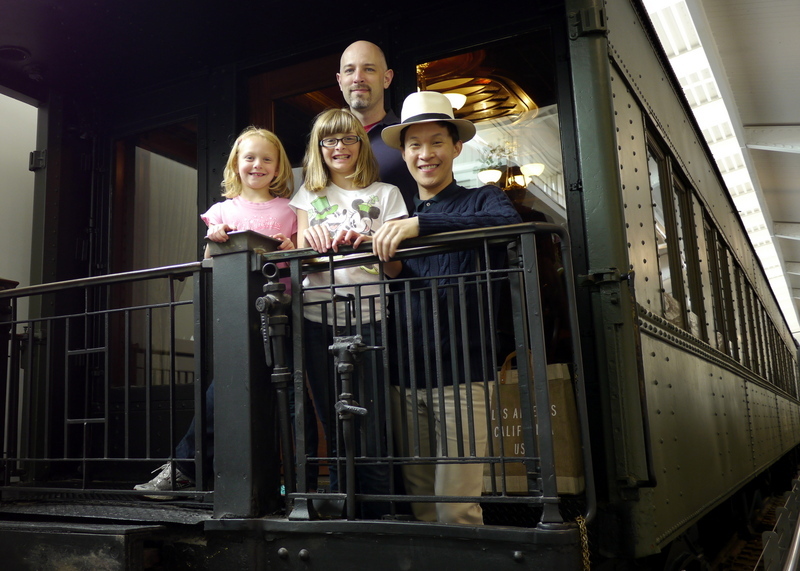 After brunch, we went to the old Union Station in downtown Omaha, home of the Durham Museum, a science and technology museum geared towards children. 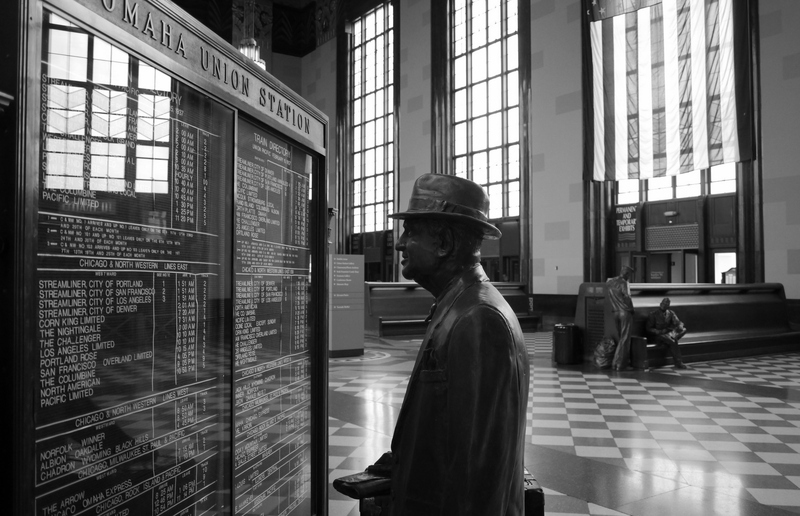 The station’s lobby has wonderful period sculptures, including this businessman reading the train schedule. Downstairs at the station, there are several refurbished train cars you can walk through, to give you a sense of what life was like on the Union Pacific line back in the day. 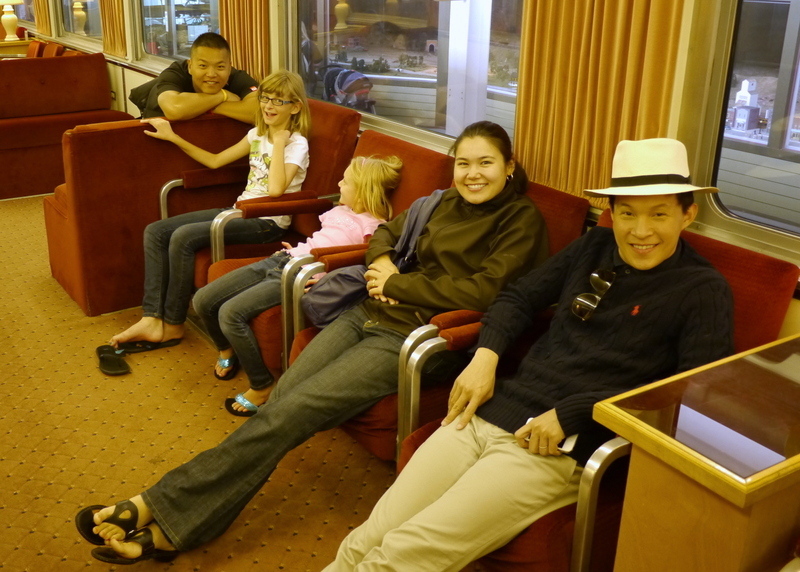 Everyone enjoyed hanging out in the lounge car. 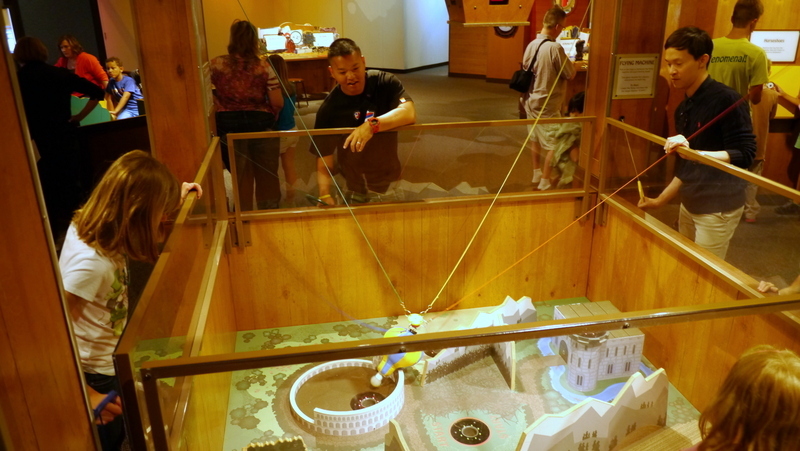 In the science part of the museum, we enjoyed an exhibit about puzzles. This one involved four people working together to raise and lower a “hot air balloon” to land on targets on the landscape. Each person controlled a rope that was attached to one of the four sides of the balloon. It took a lot of cooperations, communication, and coordination in order to land on the targets. 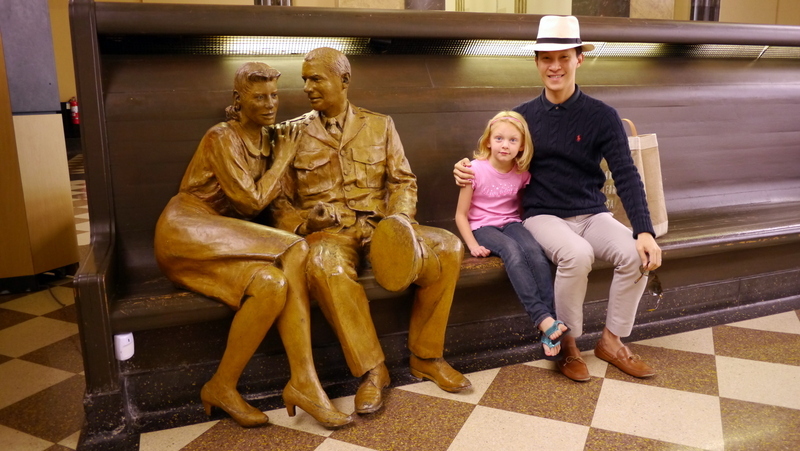 Ava and Uncle Tawn pose next to a sculpture of a soldier and his sweetheart waiting for a train to depart. Ava and Andy got along quite animatedly. 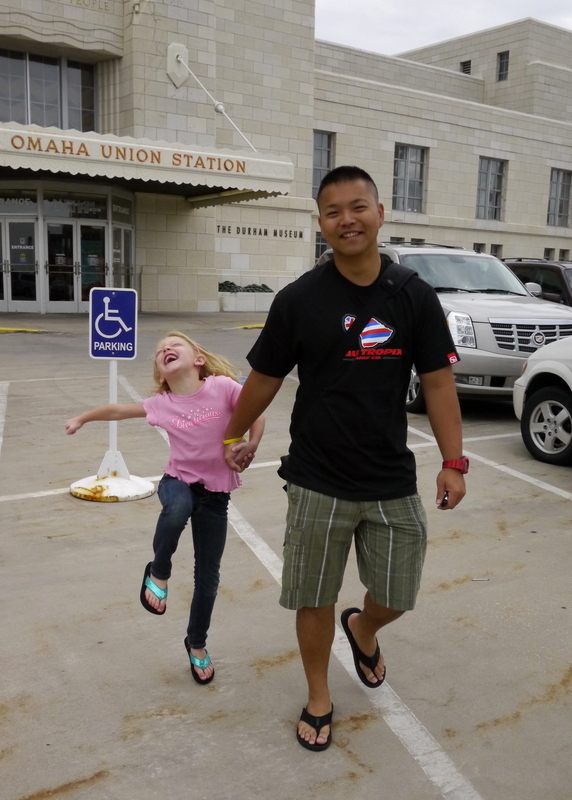 It was a fantastic two days in Omaha and I hope Andy and Sugi weren’t too overwhelmed by our nieces! This entry was posted in Uncategorized and tagged Andy, Durham, Horse, museum, Nieces, Omaha, rail, Railway, Sugi, train, UnionPacific by christao408. Bookmark the permalink. It looks like fun times, Chris — you do look like a pro on that horse — and I love the sculptures in the train station! Great pictures! Some awesome smiles were captured 🙂 You have adorable nieces. I loved the photo of Ava and Andy crossing the street! Such exuberance makes me smile – and remember when… Thanks for taking me along for this jaunt. I enjoyed it (even if I wasn’t skipping)! No dancing for me . You need to get Tawn a horse. They will also cut your grass. I have been riding since in middle school. I still enjoy riding along the beach and even letting the horse take a swim in the ocean with me still on him. I don’t lead him there but if goes in that is fine. I do love horses. awww.. such sweet happy photos of beautiful family and friends. I love how stylish Tawn is. You do look like a pro on the horse too. You guys are such good uncles. I bet the girls will remember this trip for years to come. love the photo of Ava jumping. Beautiful horses and that museum looks really interesting. Those little girls will have wonderful memories of those days! 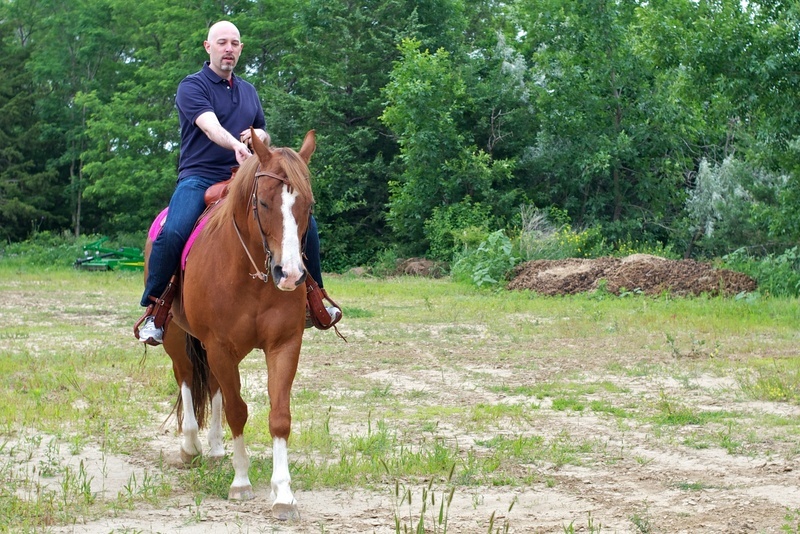 It’s been years since I rode a horse, but I really enjoyed the experience and hope to do it again someday. It was a huge, fat mare that listened easily and rode gently. She was perfect for a noob. Also, I really have to commend you for your thoroughness and dedication to sharing so much of your life here. I’m not even sure how long it’s been since you left the states, but you continue to share these memories with us. It’s very admirable- thanks. Wow. How was it having the two nieces around? Emily, the older one, looks really grown up. wow, looks like so much fun! 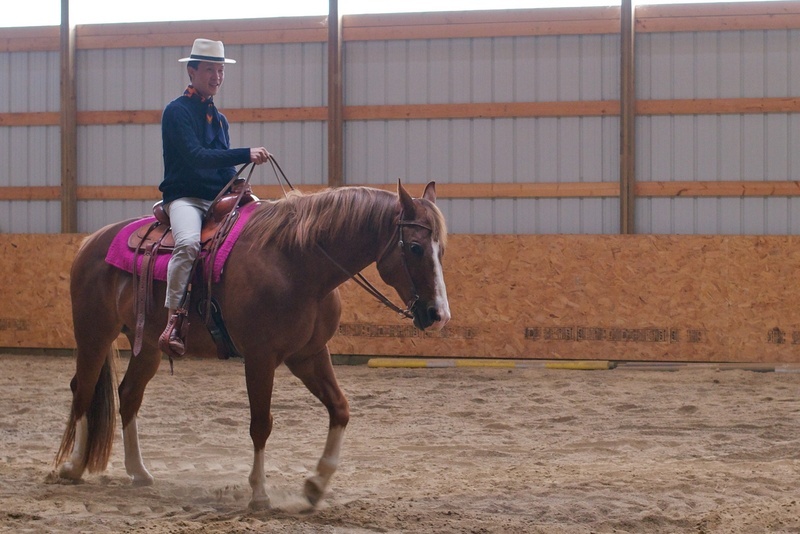 i like riding horses, although i don’t get to do it very often. i think i would have liked the science museum, too. So good that you were able to visit and have fun in Omaha with your friends. 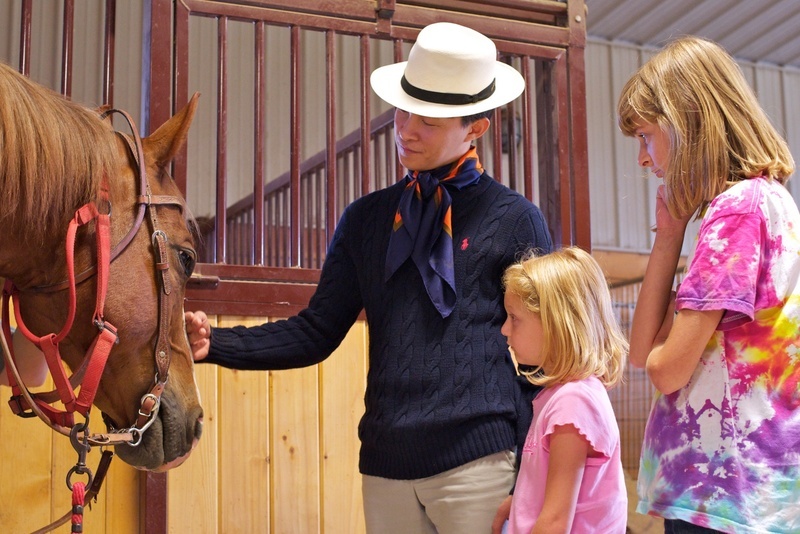 The Quarter Horses are really so docile and easy with children. The pictures are very good. And yes, you didn’t even have to ask. I knew right away you looked like a pro on that hose. Great pictures. 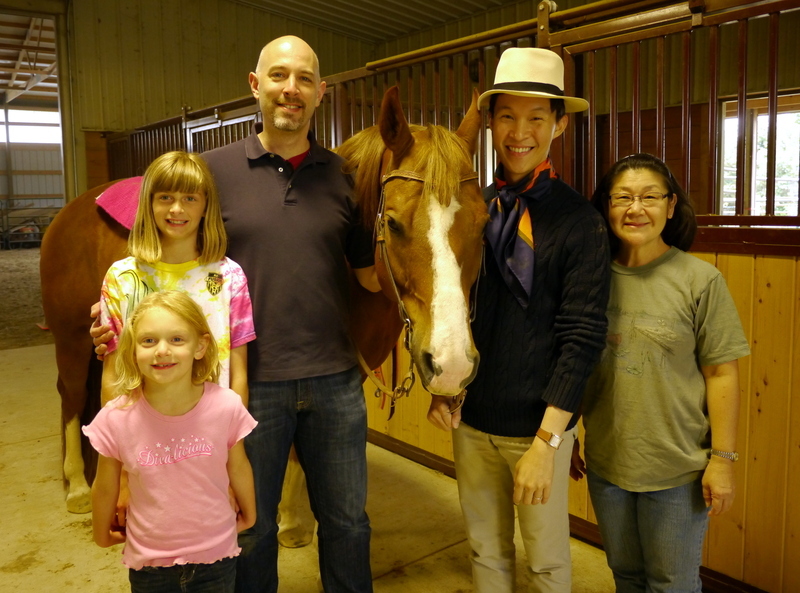 The girls had a great experience, especially riding the horses. I remember riding at my cousin’s farm outside of Maryville as a child. Talk about being afraid of the horses. I didn’t ride often enough to really feel comfortable. Thanks for sharing this part of your trip. The only thing you needed was a cowboy hat. I love the pictures of all of you – I can sense how close everyone is. This is what a family and friendship should be like. Andy looks like a big kid dancing with your nieces. @Inciteful – Thanks for the recommendation. @rudyhou – Ding ding ding! Your answer is correct. @ElusiveWords – Andy *is* a big kid. 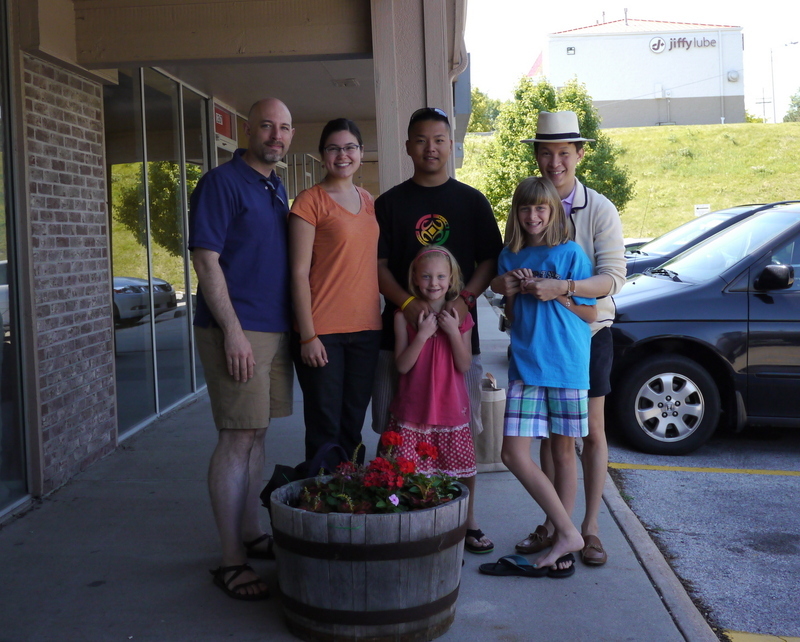 =P@jandsschultz – Hopefully, the experience helped broaden their horizons a little bit. One thing I’d like to do while you’re in Thailand next year is to do some ocean kayaking down in Phuket. Very beautiful and think the girls would enjoy. @ZSA_MD – Ha ha… you are so kind. Only a pro because I project a false sense of confidence. =D@kunhuo42 – Science museum would have been right up your soi. 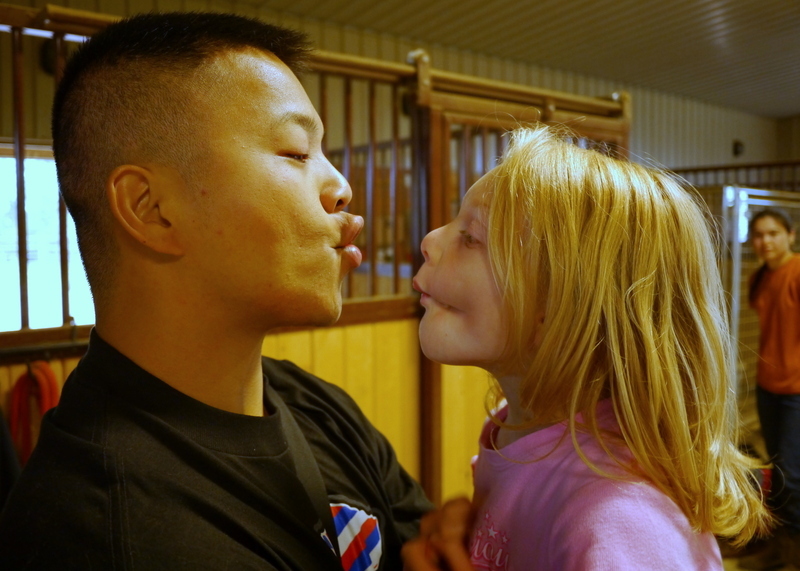 @beowulf222 – Interestingly, they are both better behaved when separated. They seem to push each other’s buttons. @secade – Thanks for the kind words Colin. We’ve been back in Thailand for five weeks now, so I’m a bit behind in my entries. Probably two more about the US, then I’ll wrap it up and what hasn’t been covered, will just slip into obscurity. @whyzat – Gosh, I sure hope they do. That’s why I took all the pictures! @awoolham – @murisopsis – Yes, that photo of Ava jumping really captures a sense of unadulterated joy, doesn’t it? @godisinthewind – Thank you so much! @Fatcat723 – Grass? What grass? =D@slmret – The sculptures were really interesting. I wish I had had a bit more time to shoot more pictures. @christao408 – gosh i feel so old now for the fact that i can guess the song. @yang1815 – There are a lot of times when I consider how much fun it would be to live back in the US, particularly either in KC or up near you guys. That’s one of those underlying things with our circumstances – sometimes I feel like I’m stuck here in Thailand because we don’t have the legal flexibility to live elsewhere. I really hope that one of these days we can split our time between the US and Thailand.